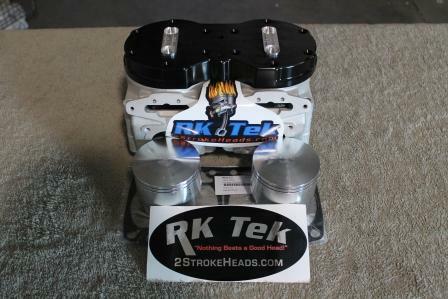 The RK Tek 925cc Big Bore kit is quite different from other Big Bore Kits on the market. This kit uses a VERY custom designed piston that is much lighter and allows for better ring seal. PLEASE NOTE: You will need to CALL for this kit and you must send in your cylinders and RAVE valves in order for this kit to be completed. It was ,PURPOSELY, designed to provide HUGE Horse-Power and Torque gains using the STOCK exhaust and intake components. We do not ask you to spend more of your hard earned money to achieve the rated HP level. We designed this kit to be the least expensive AND the highest power producing kit on the market! No need for extra large throttle bodies and custom "this and that" add-ons to jack up the price.. This kits runs SOLID without breaking the bank! This kit is 100% as reliable as stock! Sounds hard to believe.. but it is the case! This kit is rated at 190+HP (Please see the Video Links found on this page.. Videos do NOT lie!!) with the stock exhaust system. This Kit is Absolutely OUTSTANDING!! NOTE: This kit is over 200HP with the JAWS Single Pipe! It also works well with a few other aftermarket exhaust systems. RK Tek takes your stock cylinders and will bore them to 91.5mm (stock is 85mm) and then port them using our unique CNC porting technique. We then finish off the porting with hours of hand grinding to achieve our special porting lay-out and design. We than couple this with are industry leading and Patented Billet Quad Head set up for YOUR specific elevation and octane you will be feeding this power-plant! With this information ,on hand, there will be no problems keeping your engine reliable and safe during your riding season. After porting, the cylinders are re-plated with NikaSil coating and diamond honed to EXACT specs to fit the custom piston. COST of this kit is $2150.00 plus shipping and Fuel Controller. NOTE: This kit is for ALL 2007-present Arctic Cat 800 Twin Lay-down Engines! See DYNO Tech Research CUSTOMER Dyno Sheet Below. NOTE: This Dyno run was done on 91 octane with a BRAND NEW 2012 Pro-Cross 800 that still had the premix in the tank!! It was NOT RK Tek's personal sled all "tuned up" and taken to DTR. It was just a customer of RK Tek's! Expect 200HP on PUMP Gas!!! WITH the JAWS SINGLE PIPE!! This pipe works EXTREMELY Well on the 925! Hey my name is Andrew I live in north west Alberta and ride the Pacific Northwest as often as I get a chance, for the last 4 seasons I've been on an 09 M1000 and most of the time she's king of the mountain, however a good friend of mine recently bought a new 8000 proclimb and installed one of your 925 kits and he's making me look like a fool! Typically I don't like to stray too far from stock when it comes to engine modification because reliability is pandemonium in the back country but this rig he's running seems to work awesome! CHECK OUT VIDEO OF THIS BEAST ON OUR YOUTUBE CHANNEL : Here are a few Videos but there are more on the YouTube Channel: NOTE: These are ALL with STOCK exhaust with a Skinz Can!